The unauthorized immigrant estimates throughout this report are produced using a multistage method that subtracts the legal foreign-born population from the total adjusted foreign-born population; the residual then is used as the source of information about unauthorized immigrants. The main source of data for estimates from 2005 on is the Census Bureau’s American Community Survey; estimates for 1995 and 2000 use the bureau’s March Current Population Survey. See Passel and Cohn 2014 for more detail. The labor force includes all people ages 16 and older who are working or looking for work. For the analyses of occupations and industries, we exclude people who did not report an occupation or industry; this exclusion drops about 2.8 million people from the analysis out of a total labor force of roughly 160 million. About 170,000 unauthorized immigrants in the workforce did not report an occupation or industry. People in the military or with a military occupation are also excluded (about 1 million people total, but no unauthorized immigrants). This civilian labor force with reported occupations or industries, about 156 million in total with 7.9 million unauthorized immigrants, is used in computing the shares reported. State and national data for the total and U.S.-born populations are rounded to the nearest 10,000. Unrounded numbers are used for significance tests, for plotting charts and for computations of differences and percentages. Where differences are reported, they are computed from unrounded estimates and then rounded separately. Because each figure is rounded separately, the rounded estimates may not add to rounded totals. Similarly, percentages computed from rounded numbers may differ from the percentages shown in this report. Industry and Occupation Category Labels. 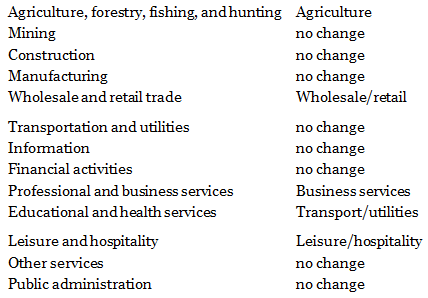 The specific, detailed categories for industries and occupations used in Tables B2 and B4 are not condensed. References in the text, text charts and tables can be cross-referenced to the lists above. More information on the Census Bureau’s industry and occupation categories can be found here: http://www.census.gov/people/io/.